Erica Voolich(right). 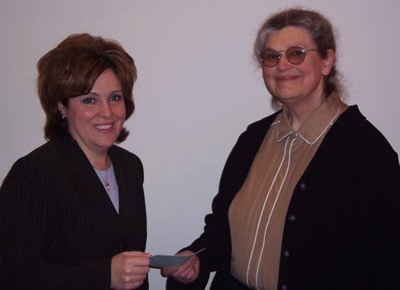 president of The Somerville Mathematics Fund, thanks Maria Lucas, Assistant Vice President Davis Square Wainwright Bank, for Wainwright's donation to The Somerville Mathematics Fund in support of the math fund's community activities and for inclusion in the bank's community room. Thanks to Wainwright Bank's online service linking charitable organizations with local donors in the bank's CommunityRoom.net, The Somerville Mathematics Fund is now able to accept online donations at http://www.firstgiving.com/20785. The Somerville Mathematics Fund as an Affiliate of Dollars for Scholars was chartered in 2000 to celebrate and encouraged mathematics achievement in Somerville. For more information, to volunteer, or to make a contribution go to http://www.somervillemathematicsfund.org or e-mail voolich@gmail.com or call 617-666-0666 (evenings).